whose feet are these from? 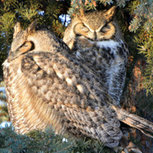 We have Great Horned Owls that kill and eat whatever they can get. We found these feet under one of their regular spots. Any idea what bird they come from? Size about 6". 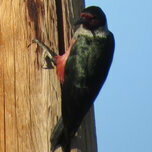 Taken in southern Alberta about 22km south east of Cardston. Either a coot or a grebe, with those lobed toes. Um.. not sure as we've never seen a grebe here and coots are rare or gone for the summer. Try looking up Google photos of American Coot feet. They're drastically different from most other birds. Phalaropes have feet like that too (at least I can't tell the difference in pictures), but they'd be half that size. (The typical tarsus length of female Wilson's, the biggest species, is 34-38 mm, or about 1.4 in, and from your figure of 6 inches, the tarsi would be about 3 inches.) I think this was a rare visit by a grebe or late coot to your area. Yes, grebes don't seem to have those notches in the lobes, as this one wants us to know. I'm liking the coot theory. 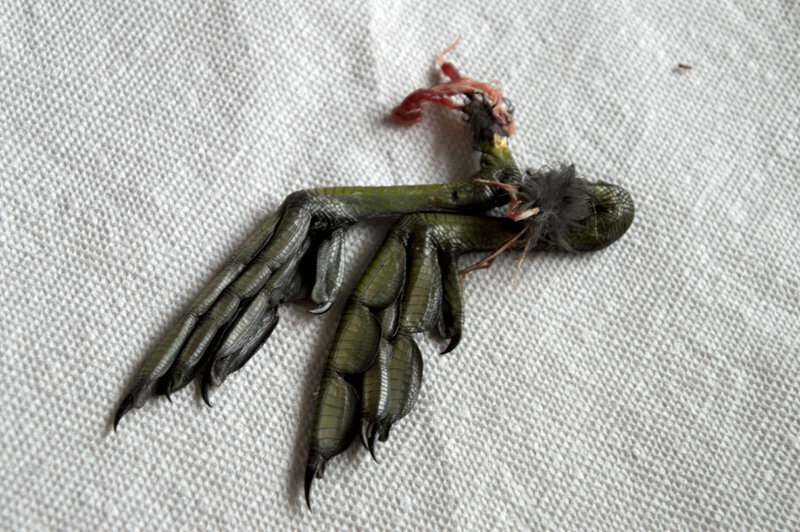 I've put together a Kickstarter to buy this poor bird some new feet. What? Doesn't need them? Why not? I never realized that phalaropes have lobed toes -- neat! But their lobes aren't divided by the bones the way we see here, rather they're continuous from base of the toes to the tips, so we can rule that out here. Exactly--the feet are in need of a new bird! By the way, according to the Oxford English Dictionary, Phalaropus was invented by the zoologist Mathurin Brisson from ancient Greek phalaris, a coot, and pous, a foot. And by the by the way, phalaris comes from phalaros, having a white patch, ultimately related to "bald". More details if anyone's interested. I didn't think you'd all have so much fun with this post!! I don't think it's a coot, grebe or phararope as they all only have 1 claw at the end of each 'branch'. Maybe it's some kind of hawk?? I don't think it's a coot, grebe or phararope a﻿s they all only have 1 claw at the end of each 'branch'. Maybe it's some kind of hawk?? No birds have multiple claws at the end of their toes -- insects do, but they're based on an entirely different underlying anatomy. What you're seeing is the result of toes stacked on top of each other. Hawks have stronger, more distinctly curved claws (termed talons) but still only one per toe. Hawks do not have lobed toes and have significantly longer and nastier claws/nails. Coots, like most birds, have four toes per foot and I count eight claws.